Information taken from Spriggs Family Tree. Samuel's wife, Mary Ann Spriggs died three years earlier, aged 33. Hello there. 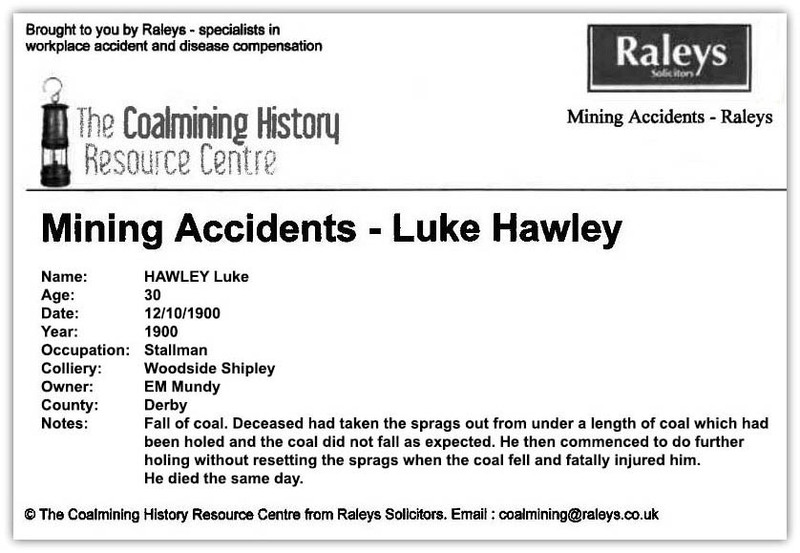 My father Mr Ernest Ellison worked and had an accident at Sherwood colliery this I know was before 1960. I wonder if you have any information on this, his father Alfred Ellison also worked there. My father Ernest Ellison left school at 14 and I believe went from school to Sherwood Pit, this would be in 1935/1936. Unfortunately we do not have information regarding your father Ernest Ellison. 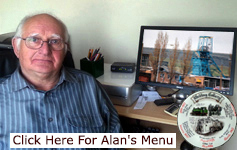 He is not on our data base of deaths (under Alan Beales). Unless the person was killed or in certain cases severely injured there are no details available, as probably in 1992 following the closure of the colliery the details and plans would or may have been destroyed. There were other copies and plans of the sites kept of the serious reportable accidents and deaths by NUM or UDM but similarly as the Mines Inspectors who mainly work from home, as their offices have closed. There is a NUM office in Byron House, next to the Retail Park, Mansfield. Sometimes the records are kept at Iron Mountain or at the compensation offices, should there have been a claim for negligence, loss of job, body parts etc. Hello! I am trying to find the record of an accident in 1944 using your site. Although I can get other dates to work the one for this year is not working. Can you help me find Thomas Fowler who was killed at South Kirkby pit, Yorkshire? I think he fell into some unguarded machinery according to family. Repaired the broken link - All I can find is a Gerald Fowler,	aged 39	who was killed on 7th June 1944 at South Kirkby, he was caught in machinery on the surface. I found Gerald Fowler in Ancestry about an hour ago but not a Thomas, although his father was Thomas. Gerald was born 19 July 1904 in Ackworth, West Yorkshire. His parents were Thomas Fowler and Jane Lavinia Welburn, his wife was Annie Calder Eckersley. It would be a big coincidence, having two miners named Fowler, being caught in machinery and killed at the same pit in the same year, Bob Bradley suggests Gerald could be his second name, Thomas Gerald Fowler. Yes that's him. One of his two sons born after he died is called Gerald after him! Yes they lived on Colliery row because my granny was sister of Annie Eckersley and she took family in when made homeless. Any detail on the accident? My oldest auntie was only 9 when it happened and she cant remember. Any snippet would be nice as I am writing our whole family history, just to share amongst the next generation who have no idea about the miners. Hi, I am looking for information on the Heape family, most of whom worked in the mine at Firbeck. They lived in Langold at 23 Ramsden Avenue. You have listed John Thomas Richard Heape, who was killed aged 16 in 1941. I have some details about him, death certificate etc, but no details of the inquest. Also if there is any information about the other family members, also including James Mariott I would appreciate it. They are my late husbands family, he was George Heape. My uncle Cyril Dale died in Harworth Pit around 27 June 1958. I cannot find anything on the accident. Looking at this site for the first time very interesting surprising what you learn. I was born in Newton, Derbyshire in 1945 my grandfather was killed by a roof fall at Williamthorpe Colliery on 19th August 1944 his name was Sidney Bramley and he was 54 not 34 as stated. I am currently researching my family ancestry and your website has been most helpful! I am on the Yorkshire database, and I have been able to find my x2 great uncle Stephenson Hargreaves; we knew he died young, but we had no idea how/why. Your website has managed to find him, give us a location and explain how he died. So thank you very much! May I please ask how you got hold of this information? I have been searching all over the place to find any hint of information! Is ‘Wrenthorpe’ the Wrenthorpe shaft of the Lofthouse Colliery? Furthermore, as you can probably imagine, I’m not exactly an expert in mining terminology or processes - could you shed some more light on ‘crushed by tubs’? I imagine full tubs of coal have somehow gone back down a track and taken out Stephenson Hargreaves? Any further light you can shed on this would be absolutely great! You have a very informative website here. Thanks for sharing. Re James Wandless who was killed at Whitwood in May 1854 - I'm interested to know the source of the death detail. You have "explosion of methane". I don't think that's what it said on the death certificate. He had just turned 16. Durham Mining Museum - 1854, Whitwood - Wandless, James, aged 14, killed "unlawfully" in explosion. Coalmining History Resource Centre - James Wandless – 26 May 1854, Explosion of Firedamp at Whitwood Colliery, Pontefract, owned by Briggs and Sons. I have just come across your data base and have found an slight error with my ancestor. I have Stephen Pitchford's death certificate and it says that he died on 24th December 1873.